Hop on our bus and enjoy this colorful remote area and take in the diverse and stunning landscapes and embrace those once in a lifetime experiences! It is no coincidence that Landmannalaugar is often called the Pearl of the Highlands. This is definitely the area to visit if you are e.g. into hiking or if you dream of a soak in an warm all-natural river! You can book a return fare either for one day or bring your tent and stay for more days. If you are driving - park your car at Hella and we will drive you safely over the un-bridget rivers and rough roads. The Landmannalaugar bus departs daily from Reykjavik at the Harpa Concert Hall and from the Reykjavík Campsite. 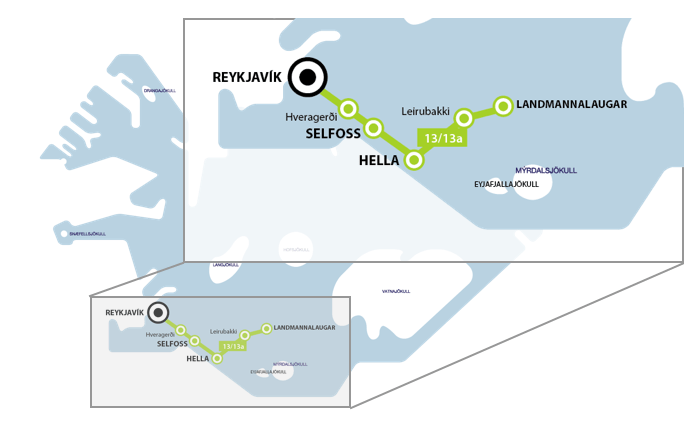 Passengers to Landmannalaugar from Hveragerði and Selfoss must embark the South Coast bus and change to the Landmannalaugar bus at Hella.